Princess Benedikte - daughter of King Frederik IX and Queen Ingrid of Denmark, sister to Queen Margrethe and Greece's Queen Anne-Marie - wears a couple of tiaras with ties to her own royal history, but this classic diamond fringe comes from her husband's German family. It was a wedding present from Richard, the 4th Prince of Sayn-Wittgenstein-Berleburg, to his bride Princess Madeleine of Löwenstein-Wertheim-Freudenberg (1885-1976), for their 1905 nuptials. Made by the noted German jeweler Koch, it shares the classic fringe design - derived from Russian traditional kokoshnik headdresses - with plenty of other tiaras. 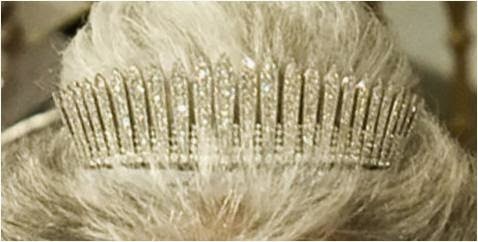 This one is distinctive by the small size of the diamond spikes placed between the tallest diamond posts. Like many other fringe tiaras, it can also be worn as a necklace. Princess Benedikte tends to choose this tiara for the biggest events she attends, things like Queen Margrethe's jubilee, Crown Prince Frederik's wedding, Crown Princess Victoria's wedding, and the weddings of her own daughters. Of course, these are usually the events that her children attend as well, and so her other tiaras are often on loan with this one kept for herself. It's an important piece and one that happens to suit her exceptionally well - the great thing about the classic fringe design is that it is almost universally flattering, but on some people it really shines, and Benedikte is one. Which of her tiaras is your favorite?